I hope everyone is enjoying this summer as much as Linda and I. We have participated in many Allante’ and Cadillac events this year and met a lot of new friends and enjoyed our regular buds. I know our club is meant to promote and protect our Cadillac two seaters, but the social aspect of our club sometimes blurs our mission. We really enjoyed the Buick, Oldsmobile, Pontiac, and Cadillac show (BOP&C show) this year. They had a great band for the kick off dinner/banquet and did not throw us out for my bad dancing. Supporting the Peach State Cadillac Club is a pleasure at the BOP&C, as well as other functions like the Stone Mountain Antique Car Show & BBQ Benefit for Alzheimer’s Association. Doug Bailey and his staff do a great job and they love us Allanté people. We have made many new friends in their membership and they are a fun loving club every bit as much as ours. 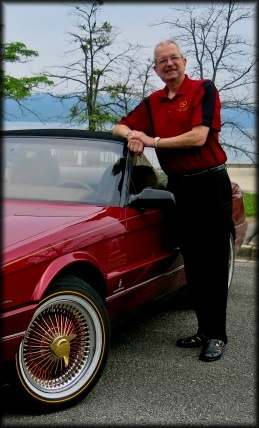 The CLC Grand National is always a star event for us and this year was great as the Allanté-XLR Chapter of the Cadillac LaSalle Club put on a program featuring former GM Executive Bill Buschmann – Allanté Project Mgr. and Mr. Ed Anderson – Allanté design team discussed what Allanté meant to Cadillac, and it was great. Terry Bressler, acting director for their club, set up a meeting with the other club presidents attending the Grand National, Tom Rohner, John Monzo, and myself to see if we could start drafting a road map leading all our clubs to a united communication and forum/entity. We had a good discussion and I came away with positive feelings that all our clubs will be working more closely in the future. We have one more national meet this year, and that is John Monzo’s Cadillac Allanté XLR Club which is in Nashville Tennessee. He has put an aggressive schedule together with something for everyone and we are looking forward to it as we are using it as our club’s fall cruise. Please, if you have not signed up for this do so! It looks like the biggest Allanté event in recent years. I know I will be meeting a bunch of new faces and enjoying all the old ones, hope to see you in Music City.